SM 3/c Wilburn L. Champ, son of Mr. and Mrs. A.W. Champ, graduated from Grandfield High School. 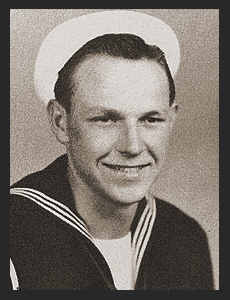 Entered the Navy in May, 1944, trained in San Diego, Cal., Sampson, N.Y., Treasure Is., Cal. ; served in Hawaii, the Marshalls, the Carolines, Australia, Ceylon, Iran, Iraq, Central America, and Guam. Awarded Good Conduct Medal, Asiatic Pacific Ribbon, Am. Theatre Ribbon.